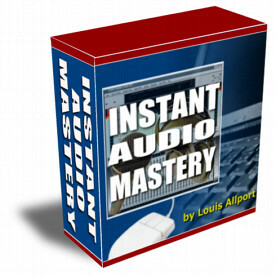 "Discover How To Quickly & Easily Master Creating And Working With Audio For Your Own Websites And Products..."
AND - Discover How To Get World Class Audio Recording & Editing Software For Free! Would you like to get world class audio editing software for FREE? Would you like to discover how to easily record and edit audio? Would you be interested in creating your own MP3's? Would you be interested in finding out how to add Flash streaming audio to your website for free? However, recently I found a new piece of audio software that is incredibly powerful and that is 100% free. However, there aren't many tutorials on how to use this great software. So what I've done is put together detailed coaching videos showing you every step of the way how to start working with and becoming very accomplished at working with audio. In this video I talk you through how to get all the free software you need to start recording and working with audio. Here I'll talk you through how to start getting to grips with using this audio software. And even if you've never used audio software before, I'm sure you'll find it surprisingly easy. In this video I'll show you how to record audio on your computer. Very important and surprisingly easy. Here I'll show you how to export your audio into different formats including the very popular MP3 format. And importantly - how to make sure your audio is suitable for visitors on dial up connections and on broadband connections. In this video I'll talk you through how you can edit and make changes to your audio so you can have a huge amount of control on what you finally choose to publish. In this video I'll talk you through how to add MP3's to your website so that your visitors can download your audio and also even play the audio directly from your website using a "play list" (few people know this trick). Here I'll talk you through how to add Flash audio to your website. "Flash Audio" are the play buttons you see on websites that often play audio automatically when you visit. Some services offer you this for $30 a month but I'll show you how to add it to your website for free.